Finally — a Viable Flatbed in an Economy Cabin! Why do people go to great lengths to get into these most coveted first and business class cabins? Think about it for a moment. All those crazy things people do, like mileage runs, incessant credit card churning, staking Wallmarts and CVSs for manufactured spend… Would we be so active (or should I say, obsessed) in this hobby if it weren’t for that burning desire to fly to our destination in relative comfort? Hell, there are people who wouldn’t even get on board if they had to fly with the unwashed masses (that, btw, is really wrong on too many levels). Now, there are ways to lie flat in coach, but there is a lot of luck involved, too. You can stretch on an empty flight if you have the whole row to yourself. I am absolutely thrilled when it happens considering the price (usually in miles) I have paid for the economy. 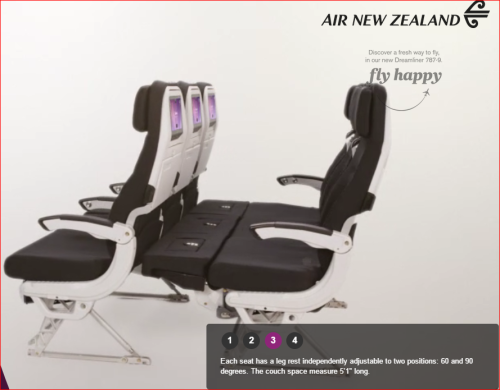 They have had these premium seats on board of 777-300 between Auckland and Los Angeles for over two years, but they are extendin this offering to other routes, as well as licensing the design to other airlines. Customer satisfaction? Very mixed. While I find the concept to be stunning in its simplicity, the execution, according to many reviews, leaves a lot to be desired. To begin with, the Skycouch won’t let you to stretch, as it’s only 5.1′ long. That won’t necessarily prevent you from a good night’s sleep, especially since the leg-rests and the cushion will add up to respectable 29″ in depth, but there is another issue. 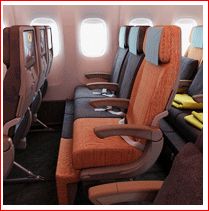 The Skycouch is located in the economy section, and there might be regular economy passengers in front of you. The major complaint is that if they decide to recline, they will encroach considerably on your personal space, just like this traveler wrote about her experience on Trip Advisor. Travellers in front were normal economy paying pax at night they pushed back their seats to be comfortable and sleep which they had every right to do. We paid an extra $700 approx. for the sky couch and we had to sit up on either side of the couch as the pushed back front seats came right into our faces. My husband and myself are not big people and would have fitted comfortably if the front seats were not pushed back. The Taiwan-based China Airlines that has just taken a delivery of the new 777-300ER has their version of Skycouch installed called Family Coach (licensed by Air New Zealand). They have improved upon the Skycouch by using fixed shelled seats that, when reclined goes forward instead of taking the personal space of someone behind you. 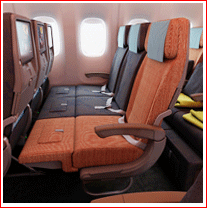 With this improvement, using Skycouch on a long-haul US-Asia flights might become a very viable option. 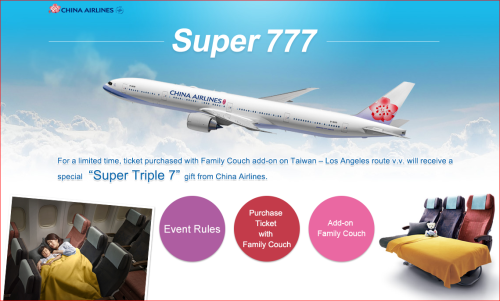 I don’t know if you can upgrade an award seat to Family Couch (China Airlines is a SkyMiles partner with Delta), but if you can, that could be quite a bargain if you are traveling with a family. Here is what upgrade would cost for a dummy cash booking I made for the flight from Los Angeles to Taipei in December. Base price: $1,110 per pax, roundtrip. 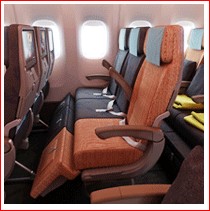 Upgrades: $1,860 for one person, $930 for two, $372 for three. If you are traveling alone, you will pay $2,970 for the Family Coach. If you are traveling with a partner, you will pay $3,149. And if you are a family of three with a small child, you will pay $3,507. Basically, when you upgrade three tickets, you pay less than $200 more for a flatbed. Now, whether or not you will be able to have a good night’s sleep depends on how small this child really is (LOL), but having individual footrests doesn’t hurt. In any case, if you are going to buy three economy tickets to Asia anyway, or if you could upgrade from an award ticket, which, I think, is unlikely, it would be silly not to grab this upgrade for that kind of money. And if you are planning your flight to Taipei for next January, they have a coupon, too. We might be at the beginning of a very interesting journey. If more airlines buy a license from Air New Zealand (or come up with innovative solutions of their own), we could return to a more civilized way to travel in economy. In all honestly, I can live without caviar and Dom Perignion, as long as I can stretch my legs, do some work, or watch a nice movie. So, would you consider flying economy couch for your next long-haul? Want to know more about free travel hacks? Sign up to my newsletters (top left). I send them sparingly, and only when I really have something to say. In addition, there are things in my newsletters, sometimes, that I do not discuss in my blog. ← Today Only: Grab a Perfect Spirit Airlines Carry-On Wheeler and Earn 18 United Miles on a $!